News---Where Have I Seen Him Before In the Movies? Of course, there must be an Abraham Lincoln. So who would you cast as the president? You won if you voted for Stephen Lang. Check the To Appomattox film website and the Internet Movie Database's entry for Stephen Lang. 150 Years Later, Preservationists See Victory At Antietam, Michael Dresser, Los Angles Times, September 16, 2012. The fighting that killed or wounded 21,000 Americans in the rolling hills of western Maryland was over in about 12 grisly hours. But a century and a half after the bloodiest day in American military history, the struggle to preserve the ground where Union and Confederate soldiers fought the Battle of Antietam only now appears close to a declaration of victory. As Americans gather to honor the sacrifice of those who fell Sept. 17, 1862 — as they are doing this weekend and Monday on the 150th anniversary — they will do so at one of the nation's best-preserved Civil War sites. Unlike many of the places where Union and Confederate forces clashed, Antietam offers visitors the opportunity to view the terrain much as it appeared at the time — without the visual clutter of the 20th and 21st centuries. "It's a remarkable success story of historic preservation," said O. James Lighthizer, president of the Civil War Trust. "Antietam is the best-preserved Civil War battlefield east of Shiloh" in western Tennessee. The prospects for Antietam's preservation didn't always appear so hopeful. For three straight years, 1989 to 1991, the National Trust for Historic Preservation listed Antietam among its 11 most threatened historic places because of encroaching development. Now the national trust considers Antietam a model of public-private cooperation to preserve historic land — not just on the battlefield, but in the surrounding area. "At Antietam, the context for the battlefield also is conserved," said Rob Nieweg, director of the trust's Washington field office. "The public in 2012 or 2050 will have the opportunity to envision what happened here." From the Publisher: The first biographical account of the life of James Gillespie Birney in more than fifty years, this fabulously insightful history illuminates and elevates an all-but-forgotten figure whose political career contributed mightily to the American political fabric. Birney was a southern-born politician at the heart of the antislavery movement, with two southern-born sons who were major generals involved in key Union Army activities, including the leadership of the black troops. The interaction of the Birneys with historical figures (Abraham Lincoln, Harriet Beecher Stowe, and Henry Clay) highlights the significance of the family’s activities in politics and war. D. Laurence Rogers offers a unique historiography of the abolition movement, the Civil War, and Reconstruction through the experiences of one family navigating momentous developments from the founding of the Republic until the late 19th century. From the H-Net Review: One of Apostles of Equality's strengths is the emphasis on [James G.] Birney's heroism and courage. Birney's was one of very few white Southern, abolitionist voices. Not only was Birney hated in the South, but, as Rogers clearly points out, most Northerners also detested Birney's agenda. Rogers reminds readers of the racism that was prevalent in the North; whites in both the North and South saw complete equality for African Americans--Birney's ultimate goal--as a serious threat. Throughout his adult life, Birney relocated repeatedly to avoid violence and keep his movement alive. The image [left] is of David Bell Birney (May 29, 1825 – October 18, 1864), son of James G. Birney. David Birney was a businessman, lawyer, and a Union General in the Army of the Potomac. To Antietam Creek: The Maryland Campaign of September 1862, D. Scott Hartwig, Johns Hopkins University Press, 2012, 8 black and white images, 17 maps, 3 appendices, bibliographic notes, essay on notes, index, 794pp., $49.96. Release date: October 15, 2012. 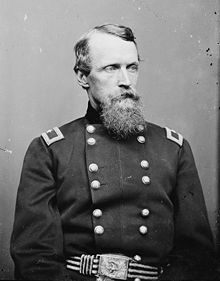 Both literally and figuratively, all other treatments of The Antietam Campaign may well stand in the shadow of Scott Hartwig's To Antietam Creek: The Maryland Campaign of September 1862. Having 800 pages and weighting three pounds, nine ounces, To Antietam Creek will be larger than any other book on most bookshelves. And . . . this is only half the campaign. Chapter one begins on August 30 with George McClellan smoking a cigar and requesting by telegram to rejoin the elements of the Army of the Potomac that are under the command of John Pope. The final chapter concludes with infantrymen and artillerymen in a restless sleep on the Henry Piper farm, George Line farms and the German Lutheran Church in Sharpsburg during the hours before dawn of September 17. The narrative style is reminiscent of Bruce Catton's Army of the Potomac trilogy. The maps are clear, precise and well labeled. The September 14 Battle of South Mountain is described in seven chapters covering 221 pages. The capture of Harpers Ferry is covered in four chapters totaling 128 pages. Tom Clemens of the Save Historic Antietam Foundation states "By far the best work done on the Maryland Campaign . . . [it] will set the standard for many, many years to come." Yes, it looks that way. "Where are the eyes of my army?" Gen. Robert E. Lee asks in the movie "Gettysburg." "Where is Gen. Stuart?" As any serious local student of the Gettysburg campaign can tell you, Lee's cavalry commander, J.E.B. Stuart, was right here in Hanover the day of the great battle to the northwest. Area historians say the cavalry clash here on June 30, 1863, delayed Stuart long enough to change the outcome at Gettysburg. And soon enough they'll have a chance to illustrate their position on the famous Electric Map of the Gettysburg battlefield. Like the cavalry riding to the rescue, Hanover developer Scott Roland has swooped in and bought the five-decade-old artifact at government auction for $14,010, beating out a still-unknown rival bidder in a daylong auction last week. And with his new acquisition, he wants to put Hanover on the Civil War map - literally. Roland plans to install the 12-ton, 29-foot-square map at the former Wachovia Bank building, which he hopes to turn into a downtown Hanover Heritage Conference Center. And he plans to add another section to the map so that the battle of Hanover can be featured as a proper prelude to Gettysburg. The news of Roland's winning bid couldn't come at a better time, with the desire to revitalize downtown Hanover as strong as ever. And with the 150th anniversary of the 1863 Civil War battles coming up next year, national interest in the Gettysburg campaign is at an all-time high. Hanover has wayside exhibits explaining the unusual cavalry fight that took place in and around the borough; there are historians here who know the story and can share it effectively. And now the Electric Map - a favorite bit of battlefield nostalgia for at least three generations of Civil War enthusiasts - will be able to serve to attract history aficionados to downtown Hanover. Hanover Business Man Gets His First Look At $14K Electric Map, Tim Stonesifer, The Evening Sun, September 18, 2012. Jim Baumgardner was excited to see a bit of Gettysburg history. "Oh look," he said, "it's Little Round Top." His voice echoed off the sides of the 40-foot storage container. Baumgardner, a Hanover architect, was standing on Tuesday afternoon with Scott Roland, the Hanover developer who last week bought the Gettysburg Electric Map at online auction for just more than $14,000, a move he said was made to bring the 12-ton map to Hanover. On a gray, rain-drenched Tuesday, Roland got his first look at it. "It's not as bad as I thought," he said, after a brief inspection of four metal shipping containers where the map has been held for the past few years. "Actually, it's a lot better than I thought." The map was cut up into four pieces and placed in storage after a new visitors center was built, and the National Park Service decided not to add the map, which dates from 1963. Chief among the government's concerns is what officials say is 3 percent friable asbestos in the map's plaster coating. It was set to be destroyed until an outcry from preservationists, a waiver obtained by the Park Service and an online auction that ended on Friday. Today, it sits in storage at a site previously unnamed by the Park Service. That holding area - which site officials asked not be disclosed because of vandalism concerns - is located not up the road from the battlefield in Gettysburg, but rather in York County. Read the rest of the story at The Evening Sun. 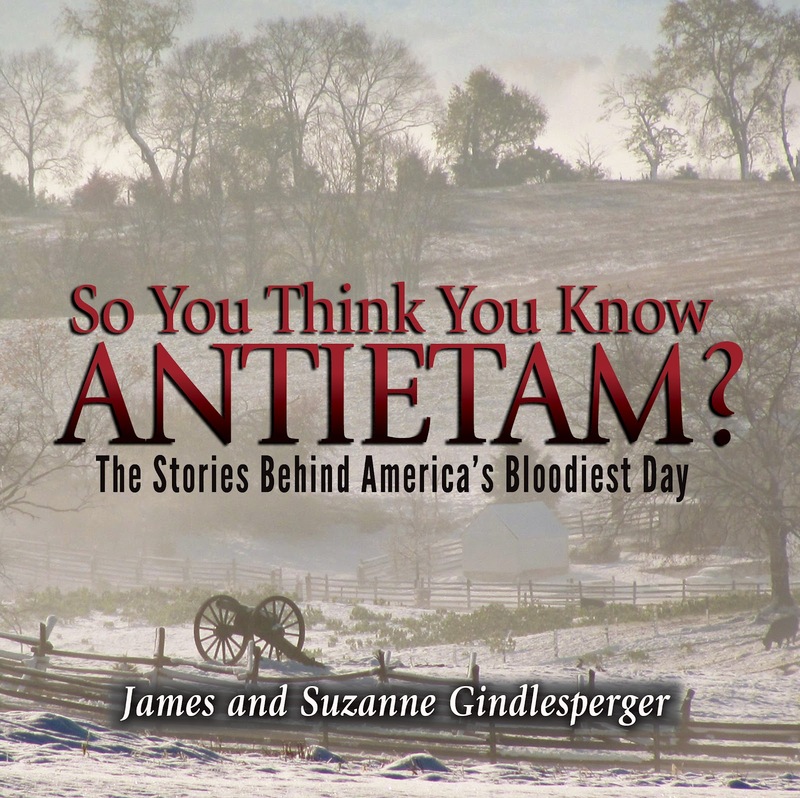 So You Think You Know Antietam? The Stories Behind America's Bloodiest Day, James and Suzanne Gindlesperger, John F. Blair Publishing Company, 232pp, 10 maps, Index, paperback, $18.95. 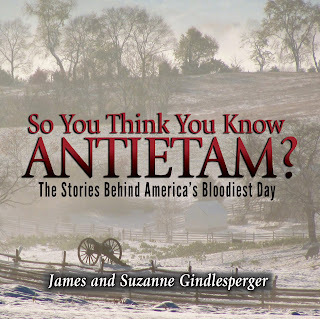 So You Think You Know Antietam? The Stories Behind America's Bloodiest Day offers descriptions and photographs of 129 monuments and sites on the Antietam/Sharpsburg battlefield. GPS coordinates are given for every site. Much of the photography is in color with several black and white wartime images, including portraits of officers. Included are the Lincoln-McClellan Meeting site, the farms, special topographic features such as the Rock Ledge in the West Woods, the Antietam train station, Lee's headquarters, Sharpsburg's Slave Block, and the National Cemetery. War Department markers, wayside markers, artillery pieces, hospitals, fences, and reenactors are briefly described in the final chapter. The appendices includes the full text of Lee's Special Orders 191, the Federal and Confederate Orders of Battle, and the U.S. Congressional Medal of Honor winners. 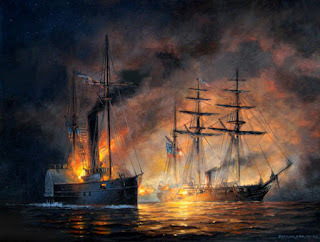 Sonar To Give Best View Yet of Civil War Shipwreck, Michael Graczyk, Associated Press, September 11, 2012. Aboard the Research Vessel Manta, Gulf of Mexico (AP) -- The world will soon get its first good look at the wreckage of the only U.S. Navy ship sunk in combat in the Gulf of Mexico during the Civil War, thanks to sophisticated 3-D sonar images that divers have been collecting this week in the Gulf's murky depths. The USS Hatteras, an iron-hulled 210-foot ship that sank about 20 miles off the coast of Galveston, Texas, in January 1863, has sat mostly undisturbed and unnoticed since its wreckage was found in the early 1970s. But recent storm-caused shifts in the seabed where the Hatteras rests 57 feet below the surface have exposed more of it to inspection, and researchers are rushing to get as complete an image of the ship as possible before the sand and silt shifts back. Full Text of Article: Associated Press, September 11, 2012. 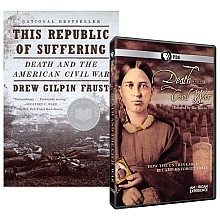 Without a doubt, This Republic of Suffering: Death and the American Civil War by Drew Gilpin Faust put the Civil War on the bestseller lists again. 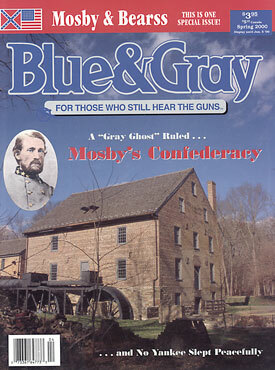 Published in 2008, Faust's work illuminated for many a new view of Ken Burns' Civil War 1990 series. Popular culture treats the American Civil War differently than scholars, buffs and reenactors treat the war. For popular culture the market place is a battlefield; products vie for mass attention and sales. Now during the 150th sesquicentennial of 1862, the public will likely take a glance at the Civil War. 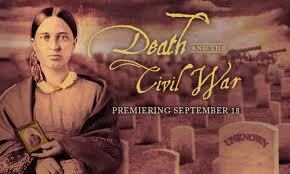 Ric Burns' Death and the Civil War will premiere on Tuesday September 18th on public broadcasting television. Based upon Faust's bestselling non-fiction work, Death and the Civil War is a sobering reminder that the Civil War was a landscape turned red by 750,000+ deaths in four years. At 120 minutes, Burns' pace is deliberate and provocative. The opening segment is jarring. A few moments before his death, a Mississippi soldier begins writing a letter to his father. The man bleeds onto the paper has he haltingly reveals his last thoughts about his life, service, death and afterlife. Within this 12 minute preface viewers' hearts may begin to break. The images that Burns selects include photography from the era; within the images there are ghosts, individuals who moved during the 30 second to a minute and half exposure time. There are subtleties in the images and texts that may move past the causal viewer; such may be the estimate that of the 750,000+ deaths 50% were not identified by name. The chapters are each about 15 minutes in length: Death, Burying, Naming, Honoring, Believing and Doubting, Accounting, and Remembering. Drew Gilpin Faust is the most frequently interviewed expert during the film; generally her remarks impart important facts but on one occasion it appears that she minimizes the 6,500+ deaths during the Enduring Freedom and Iraqi Freedom campaigns. The individual being interviewed who is most likely to be remembered is Thomas Lynch, undertaker and poet. He remarks defines and gently elevates the bleak discussions that, at times, may approach melodrama. The narration by Oliver Platt and music compositions by Brian Keane are effective in conveying grief and hope. Is there an 'Ashoken Farewell' on the soundtrack. Yes, possibly two: A Thousand Thoughts [Tusen Tankar] and Republic of Suffering in acoustic and orchestral versions. Both the film and the soundtrack are immediately available after the Tuesday evening broadcast and they are worth every penny and much more. Ric Burns' Death And The Civil War is an exceptionally fine work in the field of television broadcasting and presentation of historic artifacts, photographs and sentiments. If the U.S. Navy is mentioned in histories of the American Civil War, it is almost always with reference to the famous ironclad USS Monitor and its epic battle with the Confederate ironclad CSS Virginia. 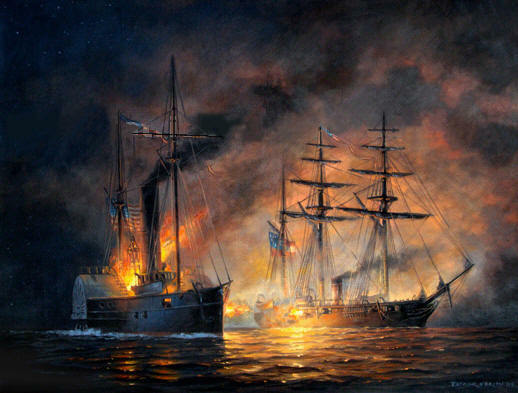 From the moment it arrived in Hampton Roads on the evening of March 8, 1862, to magnificent exhibits about the warship and its artifacts currently on display at the Mariners’ Museum in Newport News, Virginia, no other U.S. Navy warship has caught the public attention like the Monitor. Add the public fascination with shipwrecks of any kind and one has the making of a story as riveting and interesting as the Egyptian mummies. Many books have been written about the Monitor over the years, and with the 150th anniversary of the battle many more have been published recently. The vast majority, unfortunately, have offered no new insights into the warship. 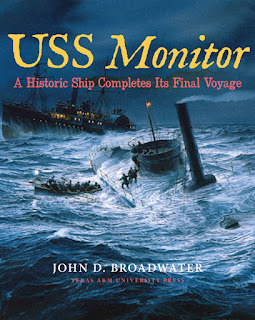 Thus it is wonderful to see John D. Broadwater’s USS Monitor: A Historic Ships Completes Its Final Voyage, which presents new information into the discovery, recovery, and preservation of the ship as only a primary source can.Broadwater served as the chief archeologist for the National Oceanographic Atmospheric Administration’s (NOAA) Monitor National Marine Sanctuary for many years. He was personally involved with numerous dives on the shipwreck and with the development of the wreck’s management plan. This work is not a formal archaeological report or history with many technical words and numbers that only a trained archeologist or historian could understand. There is no college-level thesis that the reader has to break down and analyze from different points of view. The author explains in simple and accessible language the diverse technologies used in surveying and recovering the wreck, allowing any person with a basic understanding of the sea to comprehend his study. The result is a narrative that is both educational and entertaining. For the uninitiated, the work provides a history of the Monitor’s design and operations. It includes a discussion of how and why the Monitor sank off the coast of Cape Hatteras, and what has been done since. The bulk of the work is focused on the planning and challenges of working on a wreck like the Monitor. Broadwater discusses the new maritime technologies and approaches used to both survey and ultimately raise parts of the wreck. This book also answers numerous questions, including why NOAA, a federal agency nominally in charge of such projects as managing the country’s ocean fishing stocks and monitoring the weather, is in charge of a U.S. warship (answer: the navy was not in a position to do so in the 1970s, and fortunately NOAA stepped up to protect the site). A more complete discussion about the legal status of U.S. Navy and Confederate shipwrecks could have been added to further educate the reader. In other words, why is the wreck of the Monitor different from the wreck of theTitanic? 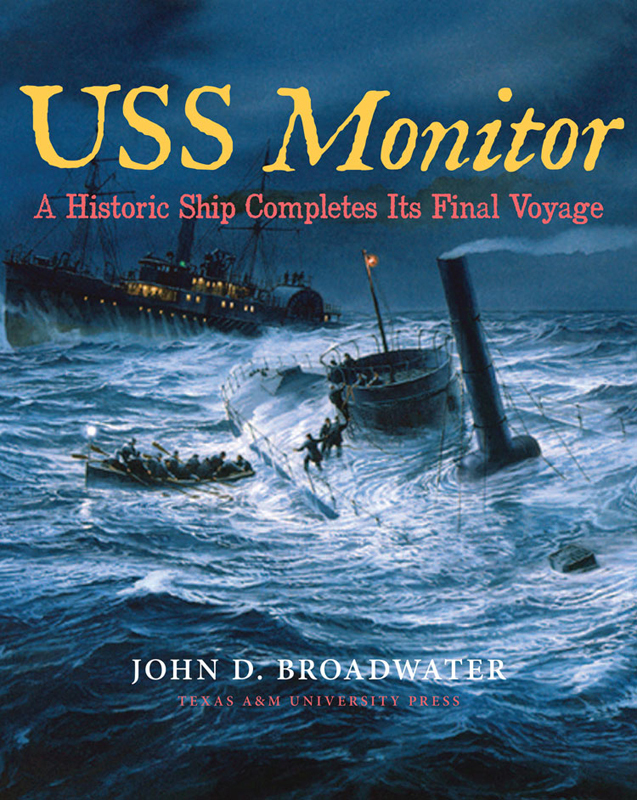 The Monitor is a U.S. government vessel while the Titanic and other civilian shipwrecks belong to the insurance companies that underwrote the voyages. But only a select few are aware of this difference. It could be argued that such a discussion and other weighty topics fall outside the scope of this work. The point of this study is to provide the general public with an overview of the Monitor, how it was raised from the depths, and what is being done to highlight its legacy. In that respect, Broadwater has succeeded. 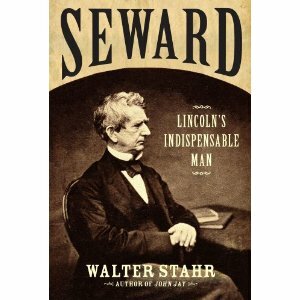 Seward: Lincoln's Indispensable Man, Walter Stahr, Simon and Schuster Publishing, 720 pages, black and white photographs, bibliographic notes, bibliography, index, $32.50. From the Publisher: From one of our most acclaimed new biographers– the first full life of the leader of Lincoln’s “team of rivals” to appear in more than forty years. William Henry Seward was one of the most important Americans of the nineteenth century. Progressive governor of New York and outspoken U.S. senator, he was the odds-on favorite to win the 1860 Republican nomination for president. As secretary of state and Lincoln’s closest adviser during the Civil War, Seward not only managed foreign affairs but had a substantial role in military, political, and personnel matters. Seward was not only important, he was fascinating. Most nights this well-known raconteur with unruly hair and untidy clothes would gather diplomats, soldiers, politicians, or actors around his table to enjoy a cigar, a drink, and a good story. Drawing on hundreds of sources not available to or neglected by previous biographers, Walter Stahr sheds new light on this complex and central figure, as well as on pivotal events of the Civil War and its aftermath. The Author: Walter Stahr was born in Massachusetts, grew up in Southern California, and attended the Phillips Exeter Academy, Stanford University and Harvard Law School. After a twenty-five year career as a lawyer he returned to his first love, American history, to research and write a biography of John Jay. Stahr lives, with his wife Masami and two children, in Exeter, New Hampshire, and Newport Beach, California. CWL: Just received a review copy and it does look impressive in regard to the research and the narrative style. If you have an extra $5 in your pocket you might be able to buy a 12-ton piece of Gettysburg history. Only thing is, you'll probably have to drop another $100,000 or more to refurbish and display the beloved but beleaguered tourist display. The Electric Map is currently up for auction through General Service Administration, an online auction site for federal property, according to an email from National Park Service spokeswoman Katie Lawhon. As of Saturday evening, no one had placed the opening bid of $5. The map - nearly destroyed because it contains asbestos but saved for auction after an outcry from preservationists - was put up for bid last Friday, according to the Park Service. The Gettysburg Electric Map, which dates from the 1960s, is currently up for auction online after approval of a waiver that kept it from being destroyed because of its asbestos content. Online listing indicates a seven-day auction, with the bidding to close Friday. among those pushing to save the map, which was added to the old visitor center in 1963 but contains about 3 percent friable asbestos in its plaster surface. Synnamon said likely the group would be unable to organize the funds this week to buy the map, but added the group would help another potential bidder if possible. The Electric Map likely won't bring a high price at auction, he said, but added the associated costs of transportation and storage could be considerable. The Park Service has not disclosed where the Electric Map is being stored, but has said the 29-foot square map was cut into quarters and placed into four large shipping containers. Images that accompany the online auction listing show such containers. Synnamon said his group hopes to be a part of restoring the map, and perhaps updating it with new technology. Old electronics could be replaced, he said, and the miles of wire that made the map work could be simulated with LED and other devices. 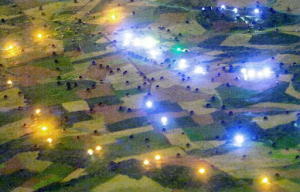 The map used hundreds of miniature light bulbs to depict troop movements during the Battle of Gettysburg. It was added as part of the commemoration for the 100th anniversary of the battle. In June the Park Service announced federal authorities approved a waiver request allowing it to be auctioned instead of destroyed. Synnamon said the important thing is that it's saved as a teaching tool for another generation. That's a process that could cost $100,000 or more, he estimated. But it would also bring back a unique piece of local history. "You'd be the only kid on your block to have one," he said. "That's for sure." More than $1.3 million in National Park Service grants have recently been awarded to help preserve, protect, document, and interpret America’s significant battlefield lands. The funding from the National Park Service’s American Battlefield Protection Program will support 27 projects at more than 75 battlefields nationwide. This year’s grants provide funding for projects at endangered battlefields from the Pequot War, King William’s War, the Revolutionary War, War of 1812, Civil War, World War II and various Indian Wars. Awards were given to projects in 17 states or territories entailing archeology, mapping, cultural resource survey work, documentation, planning, education and interpretation. The Park Service also announced the award of an additional $1.3 million in grants to help with land acquisition at four Civil War battlefields. Grant projects include fee simple purchases at Averasborough, North Carolina ($103,380); Bentonville, North Carolina ($60, 380); Cool Springs, Virginia ($800,000) and Ware Bottom Church, Virginia ($367,263). The grant funds were made available under the Consolidated Appropriations Act of 2012 (Public Law 112-74), which appropriated $8,985,600 for the Civil War battlefield land acquisition grants program. Federal, state, local and Tribal governments, nonprofit organizations, and educational institutions are eligible for the battlefield grants, which are awarded annually. Since 1996, the ABPP has awarded more than $13 million to help preserve significant historic battlefields associated with wars on American soil. More information is available online at www.nps.gov/hps/abpp. Friends of Jenkins Ferry Battlefield (Arkansas) $40,000 The Battle of Jenkins Ferry, fought April 30, 1864, was a vicious rearguard action at the end of the Union army’s failed Camden Expedition. Federal forces succeeded in repelling repeated Confederate attacks and escaping across the Saline River to Little Rock, Ark. with their supplies intact. With only a small fraction of the Jenkins Ferry battlefield currently preserved, the Friends of Jenkins Ferry hope to identify specific preservation priorities for the landscape. Prioritizing specific portions of the landscape will also provide a blueprint for future acquisitions. Gulf Archaeology Research Institute (Florida) $51,750 Until its reduction in 1864, the Confederate port of Bayport, Florida was a significant harbor for blockade runners in the Gulf of Mexico. Its destruction by the Federal navy shut down yet another point of entry to the Confederacy and threw the Florida militia into a panic. The Gulf Archaeological Research Institute intends to develop a precise history of the battle through archeological and historical research. This research will also be used to create a day-to-day battle map leading up to the battle, as well as showing its immediate consequences. Mableton Improvement Coalition, Inc. (Georgia) $75,000 One of the most significant waterways along Major General William T. Sherman's approach towards the city of Atlanta, the Chattahoochee River was heavily fortified by Confederate General Joseph E. Johnston. The Mableton Improvement Coalition intends to develop a preservation plan for those Civil War earthworks and elements of the Chattahoochee Line that still remain. The plan will be used to help determine the best practices and uses for the battlefield land. Civil War Trust (Maryland) $55,000 As the largest private battlefield preservation organization in the country, the Civil War Trust has worked tirelessly to preserve American Civil War battlefields across the county. The Trust now intends to find and develop potential funding sources for future battlefield acquisition and preservation. Specifically this effort will look at funding sources for preserving Revolutionary War and War of 1812 battlefields, protecting them from inappropriate development and preserving them for future generations. Missouri's Civil War Heritage Foundation, Inc. (Missouri) $28,500 Missouri was a border state during the Civil War and both sides recruited heavily from the population of the state. One such recruitment mission, led by Confederate Colonel Joseph Porter, was scattered at the battles of Kirksville and Moore's Mill. It is hoped that an archeological survey can find and delineate the Moore's Mill battlefield. The results can then be used for a National Register nomination and preservation plan. North Carolina Department of Cultural Resources (North Carolina) $50,000 Though the Federal blockade of North Carolina began in July of 1861, the Port of Wilmington, protected by Fort Fisher, would remain a safe harbor for Confederate blockade runners until the fort’s fall in January of 1865. This project will attempt to establish a definitive archeological inventory of submerged resources in the Cape Fear Region. It is hoped that the discovered and rediscovered resources can be used to help develop better means of site preservation and interpretation. Mosby Heritage Area Association (Virginia) $41,625 The battles of Aldie, Middleburg and Upperville are a series of running cavalry engagements fought in June of 1863. These tenacious delaying actions, carried out by the Confederate cavalry, were crucial to screening the Confederate movement north at the opening of the Gettysburg Campaign. This project hopes to build public awareness of the battlefields through education, thereby promoting their preservation. It will also look at local preservation concerns related to the battlefields. Prince William County (Virginia) $61,320 Cockpit Point was one of a series of Confederate batteries along the Potomac River that was established to blockade Washington, D.C. by shutting down shipping on the river. Established in October 1861, the Cockpit Point Battery would be manned until March of 1862. Prince William County intends to perform a military terrain analysis of the landscape and document the battlefield ' s viewsheds. This research and mapping will help in proposing an amendment to the county's comprehensive plan. Prince William County (Virginia) $77,845 Northern Virginia has numerous overlapping battlefield sites. Two such sites are the 1862 Battle of Kettle Run and the 1863 Battle of Bristoe Station. Prince William County hopes to identify preservation strategies for both of these sites while also looking at any management issues. This preservation plan will help the county evaluate future preservation opportunities at the site. Shenandoah Valley Network (Virginia) $20,000 The 1864 Shenandoah Valley Campaign was a series of battles that would drive Confederate forces from the Valley. With the loss of the Valley, the breadbasket of the Confederacy was lost, hampering Confederate attempts to continue the war. The Shenandoah Valley Network looks to implement three goals in the county's Rural Areas Plan for the preservation of the Valley's Civil War battlefields. These include a Purchase of Development Rights program, support for agricultural programs, and promotion of planning efforts to channel new development. Virginia Department of Historic Resources (Virginia) $20,000 The Virginia DHR, a longtime proponent of battlefield landscape preservation in the state of Virginia, looks to hold a two-day instructional workshop especially for its battlefield landscape landowners. This workshop will focus on landscape analysis and conservation easement policy. The workshop will also look at consensus building and how best to promote battlefield preservation during the Sesquicentennial of the American Civil War. Text Sources: National Coalition for History and National Park Service.